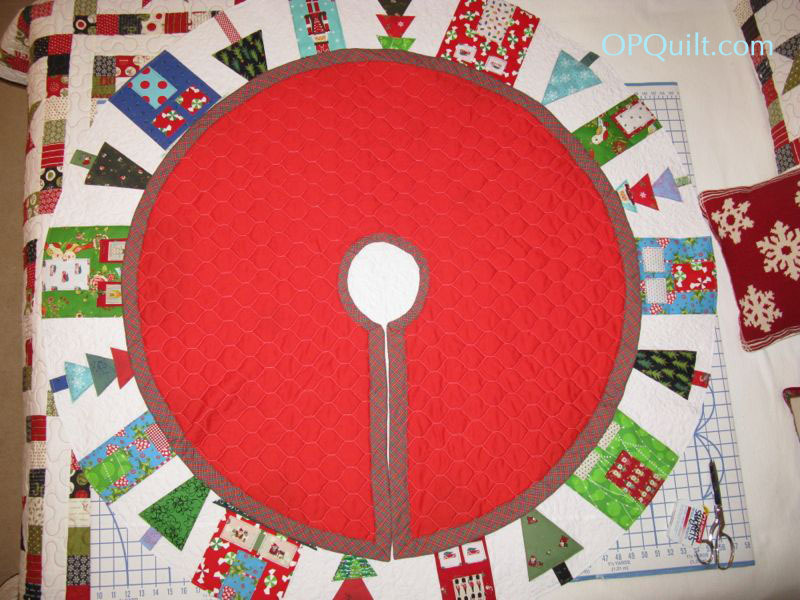 Christmas Tree Skirt | OccasionalPiece--Quilt! 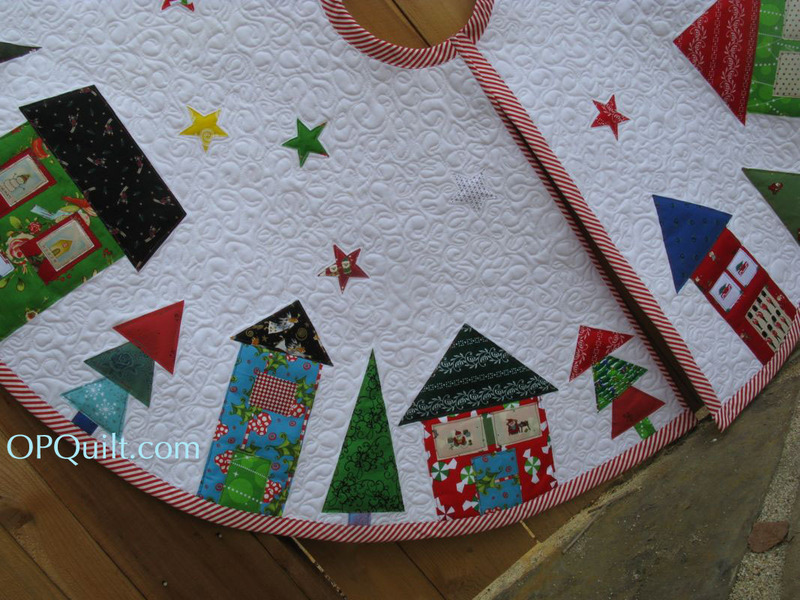 Posted on December 13, 2014 by Elizabeth E.
Here I laid out the old Christmas Tree Skirt on top of the new one; it was made in the early 1970s out of pre-quilted fabric with a tricot backing, and homemade bias tape. It has served me well, Obi Wan Kanobe, but now it was time for a new skirt. I pieced a little more onto one length of KONA snow in order for the skirt to measure 52″ in diameter, then used Steam a Seam II to cut out shapes. I was inspired by Betty’s skirt that she made last year, as well as others. 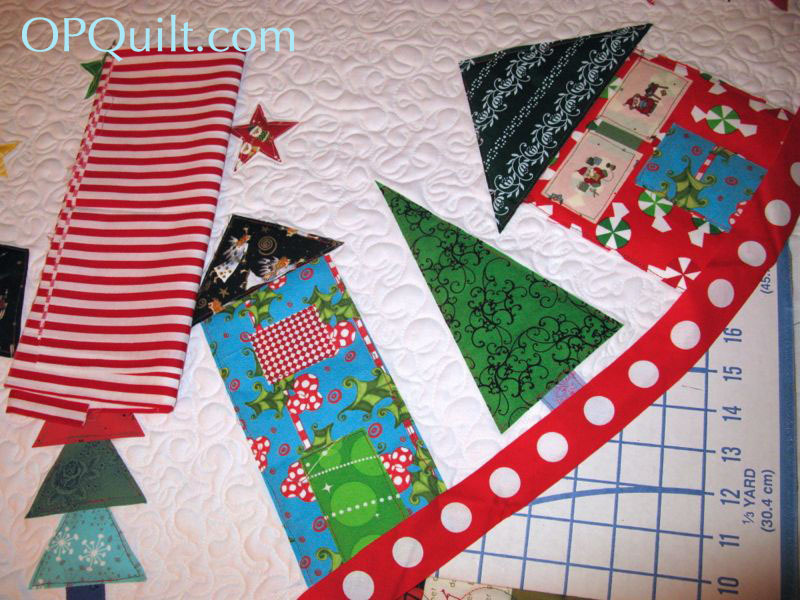 The original inspiration was a tree skirt from Fat Quarterly 2013, but since I didn’t have a pattern and it was all proportional squares, triangles and rectangles, I just started cutting. Here I’ve laid an embroidery hoop so I could judge how the center circle would look. It took me about two days to get all the houses and trees arranged, partly because I wanted to use my stash and it that necessitated some color and value balancing. I have a piece of fabric from my first quilt in here, as well as some scraps from dirndls made from German fabric (which I love). I even have scraps of fabric from cotton I’d purchased in Rome, Italy some 14 years ago, as well as some Japanese fabrics, also purchased on a trip. Build your stash, everyone. It’s a fun place to visit. Binding was interesting. I thought I’d use a large red/white dot, but when I cut it on the bias, I got this effect. Nyet! So I went with a narrower stripe than the one shown, cutting it on the bias so it would go around the curves. I pieced it, then folded it in half. A trick I learned in Clothing and Textiles was to press the curve into the bias tape. It went on like a charm. And I’m halfway through this one. Fitting, isn’t it? I need another project! We finally finished decorating the tree, and I’m enjoying the new tree skirt! Love the scrappy houses and striped binding! And what a lovely finished product. Oh Elizabeth, this is so amazing! The stripe binding is perfect. Your grandkids are going to love it. It looks absolutely amazing under your tree. Amazing work on your tree skirt!!! Love it! It is just beautiful! I love the village you have built around the tree. That will last for years to come too. Stellar job, Elizabeth! Since the 2 I’ve made were actually a commission and a gift, maybe it’s time for me to, finally, make one for myself! Love, love all your choices and it looks so good under the tree. What makes it not a quilt? Nothing that I can see. And it is a fun one. I love houses and villages and shops and trees and stars and stuff, especially at this time of year. And if you’re shy on new projects to work on, I’d be happy to send you one or twelve. Have a festive Christmas and blessings to you and yours. That looks amazing! It almost makes me want to put up a tree, just to have an excuse to make a skirt (not that mine would turn out like yours did!) 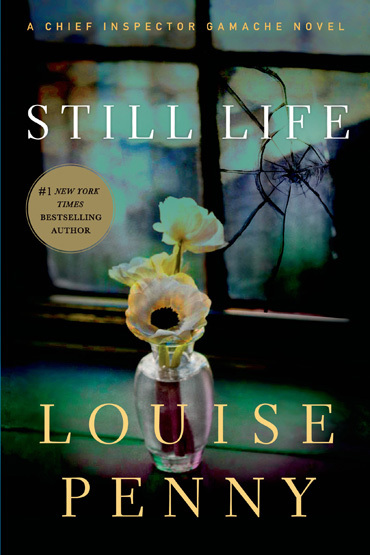 And I love the Gamache books–I wait on the edge of my seat for each new book to come out. Lovely skirt! I so need a new one. I think that every year. Was it killer to cut out the quilted circle? Your Christmas tree skirt is so “modern” and it looks great under the tree. Stash is good. Have a Merry and Blessed Christmas. This is one of my favorite Occasional Piece creations–but then, I say that about all your creations! 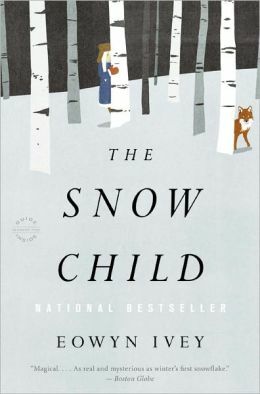 I read The Snow Child. Can’t wait to talk to you about it! Holy wow! This is the only time I’ve ever been inspired to make a tree skirt! 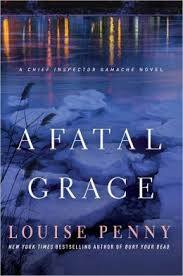 I love the Louise Penny series too. Really enjoyed reading about the process. Love it! We are in need of a new tree skirt and with my husband’s collection of Dept. 56 houses, this is PERFECT!! Thank you so much for sharing! 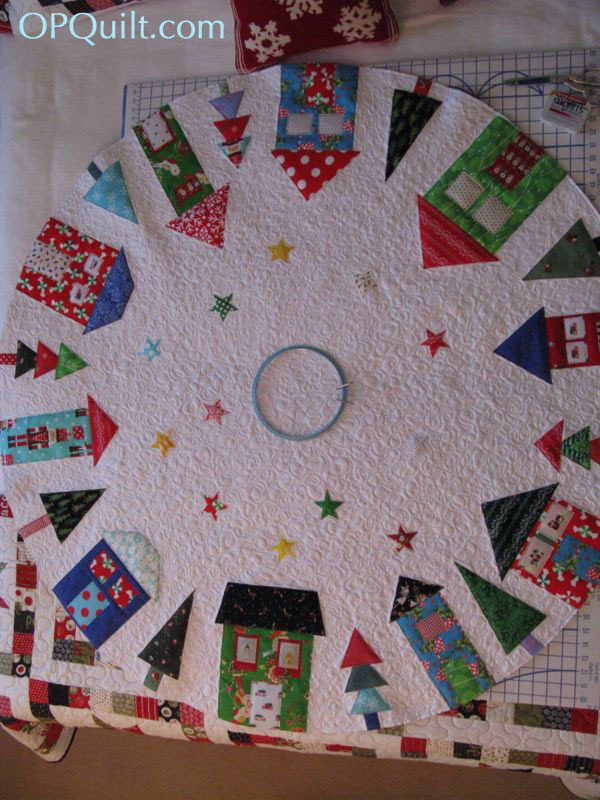 Love the tree skirt, do you have a written pattern? I’m with everyone else in that you should make a written pattern or tutorial for the rest of us. I LOVE THIS! It looks perfect! 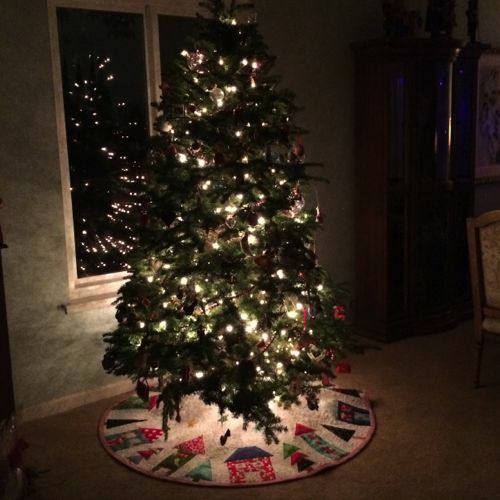 Beautiful tree skirt…I just love it!